For our first experiment this year we wanted to find out which bubble solution would produce the longest lasting bubbles. We made a glycerine, soap and water solution in our classroom. We also had a store bought bubble solution. We went outside and blew bubbles using each of the solutions. We did two trials. We discovered that our glycerine solution made the longest lasting bubbles. We also learned that bubbles have three layers – soap, water and soap. They surround the air which is in the middle of the bubble. Last week in school we learned about conductors and insulators. We used hand warmers and thermometers to investigate different materials. We found out paper and foam were the best insulators. Then we had to design a container that would keep the ice pops from melting for one hour. Before they were frozen we measured and the ice pops had 170 ml of liquid. 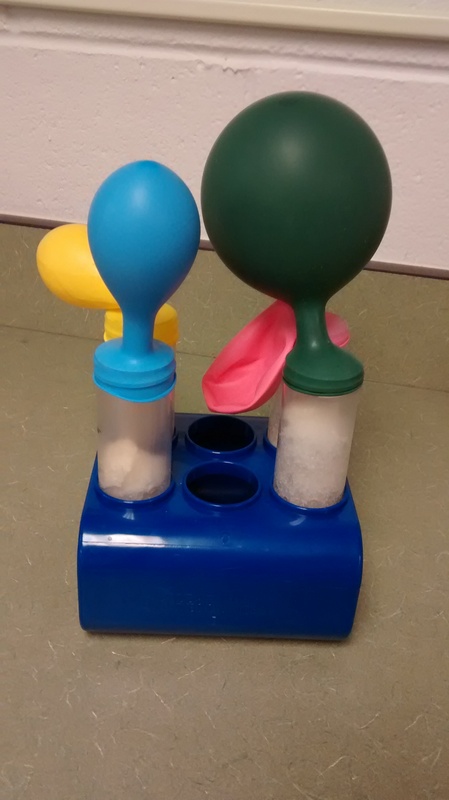 Our class designed 4 different containers to keep the ice pops frozen. We used paper boxes, plastic and foam. We put the ice pops in the containers and after one hour the ice pop in the best insulated container had only melted 4 ml! We checked the ice pops at 2 hours and 4 hours. By the end of the day, 5 hours later, only 44 ml had melted from the same ice pop. We discovered that plastic was the best insulator for our containers. It was fun doing the experiment. Why Doesn’t the Ocean Freeze? For the school science fair our class wanted to find out why the ocean doesn’t freeze. The materials we used were water, salt, 4 bowls, a tablespoon and spoons. Our hypothesis was IF we added a salt concentration to water, THEN the water will not freeze. First, we used 4 cups of water for each bowl. and added 0, 1, 2 or 3 tablespoons salt to the bowls. Then we put the bowls in the freezer but by the next morning all the water had frozen. So we decided to try the experiment again using more salt. We used 5, 6 and 7 tablespoons of salt in the bowls. We discovered that it took 7 tablespoons of salt for the water to not freeze. Five and six tablespoon made the water slushy. Our hypothesis was correct but it took more salt than we originally thought. Our favorite part was when it came out of the freezer and we got to see it. On Thursday we did an experiment to find out if crystals will grow on pipe cleaners. The materials we used were hot water, borax and pipe cleaners. We made shapes like snowflakes and dinosaurs out of the pipe cleaners. Then we mixed the borax in boiling water to make the solution. Our hypothesis was IF we put the pipe cleaners in the borax solution, THEN the crystals will grow. Next, we soaked the pipe cleaner creations in the borax solution overnight. On Friday we took them out of the solution. They weren’t plain pipe cleaners anymore. They were beautiful crystal covered shapes. We proved that our hypothesis was correct. On Friday, October 23 our class did an experiment to find out what colors were in leaves. We used red, green, and yellow leaves. My group had red leaves. First, we tore up the red leaves. Second, we put them in a test tube. Third, we covered them with 25 ml of rubbing alcohol. Fourth, we put the test tubes in hot water for 30 minutes. Then we put a strip of a coffee filter in each test tube. Over the weekend the true colors of the leaf separated into bands of colors. 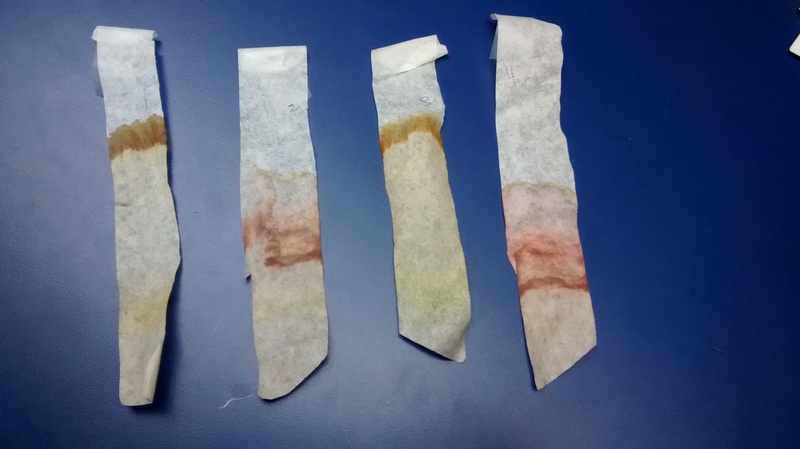 Our red leaf showed yellow, brown and pink on the coffee filter. On Friday, October 9, 2015, our class tried to answer the question is yeast alive? We used six materials. We used brains, test tubes, yeast, sugar, balloons and water. First, our class made a yeast and water mixture. Next, we filled test tube 1 to 25 ml, added sugar and put a balloon on top. The class filled test tube 2 to 50 ml, added sugar and another balloon. Next, we put just the water and yeast mixture in test tubes 3 and 4. They had a bubbly chocolate color. Five minutes later test tube 1 rose from 25 ml to 75 ml. Test tube 2 went from 50 ml to 100 ml. In test tube 3 the balloon filled a little. In test tube 4 the balloon was not filled at all. They had no sugar in those test tubes. At the end of the experiment the balloons on the two test tubes with sugar filled with carbon dioxide. Our class found out that yeast is alive because it moved, grew and breathed. I felt happy because I learned something new.